Lenovo presents new ThinkPad S431 notebook with optional touchscreen display starting at $699 and available this June. Meanwhile the ThinkPad Edge E431 and E531 announced back at CES are now available for purchase. At the beginning of the year, Lenovo showcased the entry-level ThinkPad Edge E431 and Edge E531 at CES. Sporting 14.0-inch and 15.6-inch displays respectively and with processor options ranging up to a Core i7, the notebooks are now available for purchase with prices starting at $509. Lenovo is also announcing its new ThinkPad S431, which the company is aiming at ‘image-conscious small businesses’. The design manages to squeeze a 14-inch screen into a 13-inch casing by slimming down the bezel. It also features a sand blasted, anodized aluminum LCD cover and a bevelled underbelly that Lenovo claims gives the notebook a 'floating' appearance. In an attempt to simplify the design of the S431 it also features a five-button clickpad with glass surface. When it comes to specs, Lenovo isn’t going into specifics except to say the ThinkPad S431 will be “powered by Intel 3rd generation Core processors, making it 15 percent faster than its predecessor with up to nine hours of battery life”. It will include 500 GB of storage, up to 8 GB memory, have two USB 3.0 ports and will be able to connect to the ThinkPad OneLink Dock via a single cable. Unfortunately in regards to specifications, that is all the details Lenovo is willing to part with for now. The ThinkPad S431 will be available beginning June 2013 starting at $699. RESEARCH TRIANGLE PARK, N.C. – April 30, 2013: Lenovo(HKSE: 992) (ADR: LNVGY) today announced its new ThinkPad S431, a premium laptop PC featuring an elegant floating design and touchscreen display. Optimized for Windows 8, the ThinkPad S431 offers enhanced performance and 15 percent faster processor speed than previous generations. The laptop is ideal for professionals who want a combination of style and substance. It is also a fit for small businesses that need a laptop to do it all – great performance for work tasks and an excellent experience for personal computing. The S431 is one of the first ThinkPads to feature Lenovo OneLink technology, which allows users to connect to the ThinkPad OneLink Dock with a single cable for dedicated video, additional USB 3.0 ports and gigabit Ethernet, all while powering the system. Featuring an ultra-thin bezel, the ThinkPad S431 is able to fit a 14-inch LCD screen in a 13-inch frame. The aesthetic exterior includes bevelled edges on the front and side, giving the illusion that the PC is floating and making the 20.5 mm frame look even thinner. A real aluminum LCD cover, available in fashion-forward silver or graphite black, is sand blasted and anodized, making it smooth to the touch for a premium feel. The ThinkPad S431 also boasts a simplified interior with a five-button clickpad with glass surface to eliminate clutter, adding to the overall clean look of the laptop. The optional multi-finger touchscreen makes swiping, selecting apps and resizing images a breeze – allowing Windows 8 to be used as intended. The display features 180-degree open angle that lets users interact with the laptop in a number of usage modes and improves the overall touch experience. The ThinkPad S431 has a six-row backlit keyboard that includes Windows 8 optimized shortcut keys. Additionally, the large, responsive touchpad supports Windows 8 gestures, providing users with a powerful and intuitive way to be more productive and interactive with their laptop. The ThinkPad S431 is powered by Intel 3rd generation Core™ processors, making it 15 percent faster than its predecessor with up to nine hours of battery life. With up to 8 GB of memory and 500 GB of storage, users don’t have to sacrifice responsiveness for performance. The S431 can store up to 150,000 MP3s or 250 full-length feature films. The laptop features two USB 3.0 ports for fast data transfer. First announced at CES, the mainstream ThinkPad Edge E431 and E531 are now available for purchase. For small businesses on a budget, the E431 and E531 laptops also include Lenovo OneLink technology for new docking capabilities. In addition to touch functionality, the slim ThinkPad Edge E431 and E531 laptops feature improved graphics options for more vivid content on their displays, up to full HD, and a five-button touchpad lets users control Windows 8 features from the keyboard. 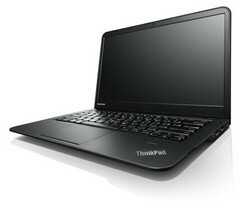 The ThinkPad S431 is available beginning June 2013 from business partners and onwww.lenovo.com. Pricing for the ThinkPad S431 starts at $699. The ThinkPad OneLink Dock is available beginning May 21. The ThinkPad Edge E431 and E531 are available beginning April 30 from business partners and on www.lenovo.com. Pricing for the ThinkPad Edge E431 and E531 starts at $509. For the latest Lenovo news, subscribe to Lenovo RSS feedsor follow Lenovo on Twitterand Facebook.